It is INTERNATIONAL TALK LIKE A PIRATE day, and as such I've gone looking for something appropriately swashbuckling to lace in with todays metal theme. And I sucked, because Luke found todays focus. Meet Alestorm. I was initially dubious about the "metal-ness" of the band - they're pretty jaunty and there IS a keytar and a violinning midget (midget sadly is not a permanent fixture) but they're signed to Napalm Records, which justifies the metal tag in my mind. And thank god for that, because I want and need to show you this. It keeps getting better. I am completely in love. And to keep the rolling piratey goodness going - this is Keelhauled. Can I even make fun of these? Good jeebus. There's just so much to love. I'd also highly suggest a commemorative listening to You Are A Pirate, in honour of this special day. Captain Feathersword needs to take some damn notes. 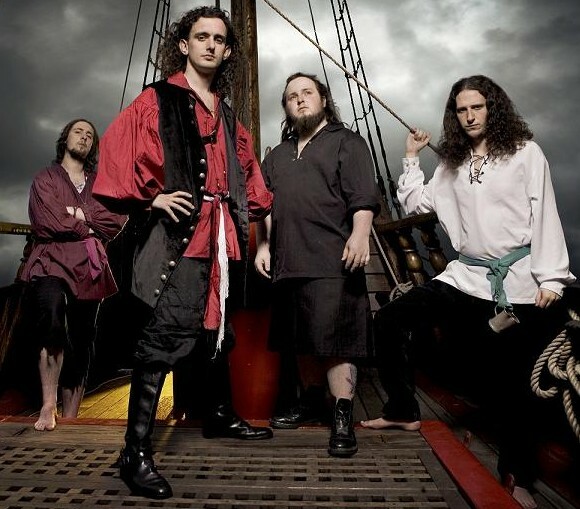 I love Alestorm. They came to the Trocadero in Philly and I was planning on going for the longest time but last minute realized it was a sunday. Damn calendars.